The Monroe Doctrine, which since 1823 had viewed any European intervention in the Americas as a threat to U.S. security, coupled with the sinking of the U.S.S. 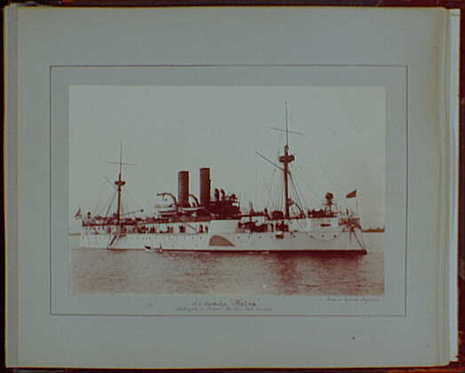 Maine in Havana harbor precipitated the U.S. engagement. Coverage by both the Hearst newspapers and the nascent film industry solidified public support for involvement in Cuba's struggle for independence. Within months, Spain's overseas empire, which had begun with Columbus' voyages of discovery, finally collapsed under the U.S.' two-pronged war strategy. Commodore George Dewey sailed to the Pacific the day that war was declared. On May 1 the Spanish fleet was defeated in the Philippines. 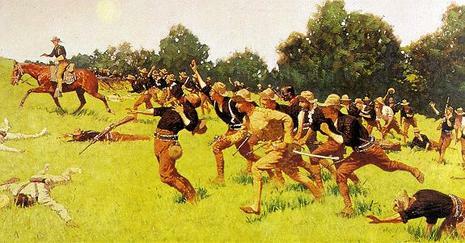 The U.S. Marines and other troops, including Teddy Roosevelt and the Rough Riders, helped defeat Spanish forces in the Americas. On April 19, while Congress was considering joint resolutions supporting Cuban independence, Senator Henry M. Teller of Colorado proposed the Teller amendment to ensure that the United States would not establish permanent control over Cuba following the cessation of hostilities with Spain. The amendment, disclaiming any intention to annex Cuba passed Senate 42 to 35; the House concurred the same day, 311 to 6. The amended resolution demanded Spanish withdrawal and authorized the president to use as much military force as he thought necessary to help Cuba gain independence from Spain. President McKinley signed the joint resolution on April 20, 1898, and the ultimatum was forwarded to Spain. In response, Spain broke off diplomatic relations with the United States and declared war on April 25. On that same day, Congress declared that a state of war between the United States and Spain had existed since April 20 (later changed to April 21).